The Cities of Pittsburgh and Allegheny, With Parts of Adjacent Boroughs, Pennsylvania. The City of Cincinnati Ohio. An excellent 1855 first edition example of Colton's rare two part map of Pittsburgh, Pennsylvania and Cincinnati, Ohio. The map is divided into two sections. The lower map, Cincinnati, Ohio, covers from Mt. Harrison to Fulton and From the Ohio River to Mt. Auburn. In addition to all major streets, this map identifies the Water Works, a Railroad Tunnel, Miami Canal, Whitewater Canal, the site of Fort Washington, the Mt. Adams Observatory, and the Military Barracks. 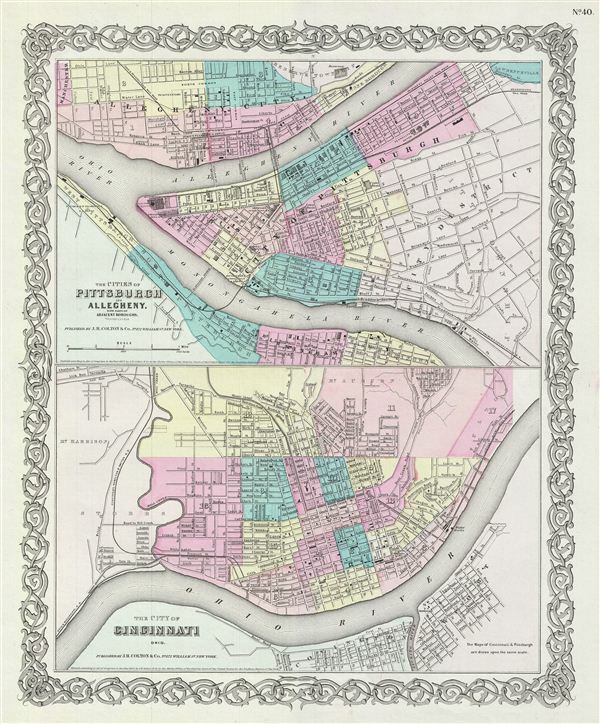 The upper map, The Cities of Pittsburgh and Allegheny, Pennsylvania, covers from the Ohio River to Morgan Street, including the surrounding boroughs of Allegheny and Birmingham. In addition to all major streets, this map identifies the Court House, various railroad depots, the Penitentiary, and Pennsylvania Canal. Both maps are hand colored in pink, green, yellow and blue pastels to identify city wards. Drawn to the same scale, they also offer extraordinary detail at level of individual streets and buildings. Surrounded by Colton's typical spiral motif border. Dated and copyrighted to J. H. Colton, 1855. Published from Colton's 172 William Street Office in New York City. Issued as page no. 40 in volume 1 of Colton's 1856 Atlas of the World. Rumsey 0149.045 (1856 edition). Phillips (Atlases) 816.